The more and more I work with friends on Etsy, I am continually inspired. I am admittedly in love with homemade art! Arienne Zimmerman on Etsy is one of these inspirational shops I'm happy to share with you today. Arienne, the artist behind it all is one busy lady! in addition to her shop on Etsy, she is a grade school teacher who shares her creativity with kids everyday. Inspired by her mother at a young age, Arienne has been creating ever since. Arienne Zimmerman's jewelry is super unique. She creates cast resin jewelry necklaces and earrings, as well as felt necklaces and earrings. I have never seen anything like her work. The cast resin jewelry pieces contain real flowers, and plant preserved inside. Arienne has been able to use this art to preserve flowers from special occasions this way. Currently she is working on a custom necklace for a client who's grandmother passed away. How lovely she will be able to help preserve not only some of these flowers, but the memories forever. I was able to review this beautiful cast resin necklace posted above. Apparently many of Arienne's necklaces get sold before she even gets to post them on Etsy...she is that good! When I received her necklace I was in awe! I have never worn a necklace like this before (again...the uniqueness of this shop)! My husband LOVES it on me as well. Its again, another one of those pieces of jewelry that look so much prettier in person, and on. I love the organic essence of this necklace. 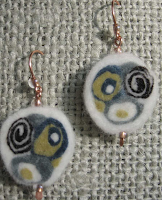 The felt jewelry in Arienne Zimmerman's shop is pretty amazing as well! I like the idea of having something very light weight around my neck, and earrings that are effortlessly worn. I can tell that these necklaces must take a lot of work. I must say that some of these necklaces remind me of candy. :) I think of course these would fantastic for adults, but also super cute for kids and teenagers! Visit Arienne Zimmerman on Etsy and you will LOVE her work! As I mentioned earlier she does custom work and "enjoys working creatively" with her customers. Etsy has a conversation/email button that will help make your inquiries easier. You my readers, are so lucky, because you have a chance to win one of these amazing felt necklaces from Arienne Zimmerman on Etsy! Win this one pictured above. This one happens to be one of my favorites! One reader will win a Felt Necklace from Arienne Zimmerman on Etsy! US and Canada only. Giveaway will end September 19th at 11:59 p.m. EST I was given a necklace from Arienne Zimmerman to review. No other compensation was received. All opinions are my own. This promotion is in no way sponsored, endorsed or administered by, or associated with, Facebook. We hereby release Facebook of any liability. Winner(s) will be contacted by email 48 hours after the giveaway ends. If you have any additional questions - feel free to send us an email! 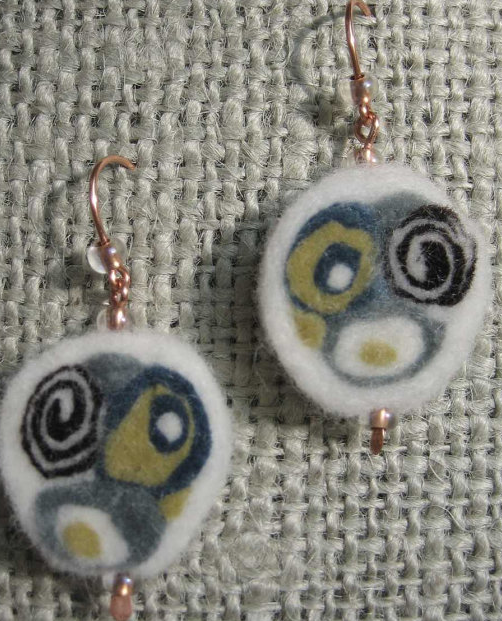 I love the Bulls eye felt bead earrings. Thanks! The Cast resin necklace with dried flowers and copper wire is my favorite! I love the cast resin with dried flowers line,. so pretty! I love the Long felt and glass bead necklace! Cast resin necklace with dried flowers and copper wire is my favorite. 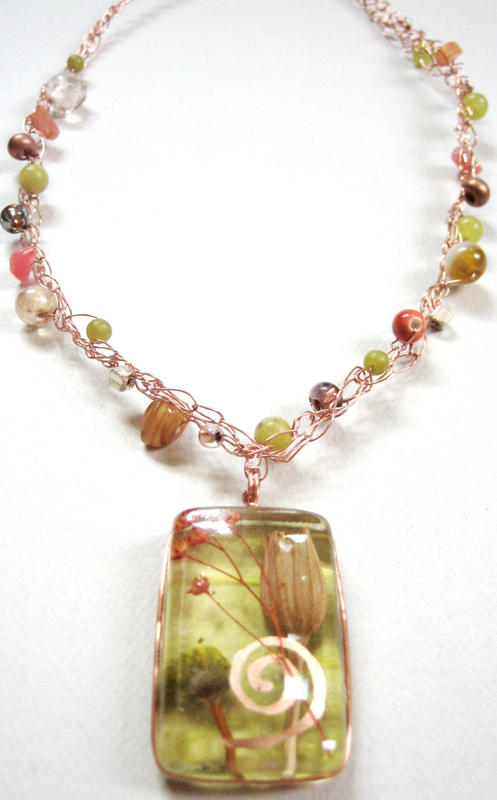 I love the Cast resin necklace with pink, orange, yellow, and green dried flowers and copper wire. Long felt and glass bead necklace is my favorite. To hard to pick a favorite....I would love any item!! 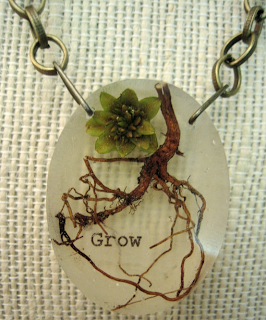 My favorite item is the Grow cast resin pendant necklace with roots and flower. I love the resin necklass with the pink dried floweres. The black and white felted neclace is pretty. I like the Cast resin necklace with dried flowers and copper wire.